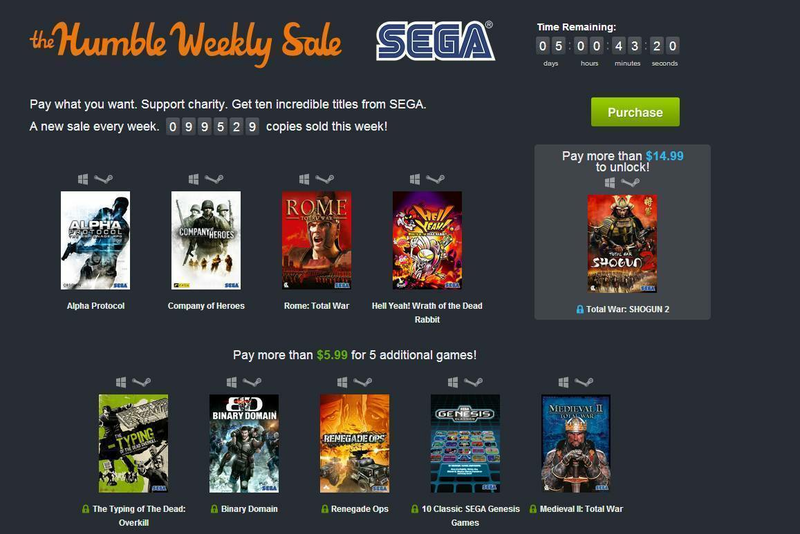 The Sega Humble Bundle was released a couple of days ago and will last until March 20th, 2014. The Humble Bundle is a weekly sale where you can pay whatever you want for a bundle of video games and percent of the sale goes to charity. You can actually decide how much of it goes to the creators, how much goes to charity, and how much to tip. If you pay under $6, you’ll receive Alpha Protocol, Company of Heroes, Rome: Total War, and Hell Yeah! Wrath of the Dead Rabbit. If you pay $6 or more, you will receive all of those games plus The Typing of the Dead: Overkill, Binary Domain, Renegade Ops, 10 Classic SEGA Genesis Games and Medieval II: Total War! If you pay $15 or more, you will get all of those games plus Total War: SHOGUN 2. You can get a ton of video games and donate to charity at the same time! Sounds like a great deal to me!